The dental industry has rapidly expanded in the last few years. Cosmetic dentistry is booming and as scientists continue to develop new techniques and technologies the industry is set to stay strong for many years to come. Dental nursing has also experienced a similar growth with the introduction of mandatory registration a few years ago helping to change attitudes towards dental nursing as a profession. Nowadays there is a lot more respect for those in dental nursing careers, and as a result more people feel empowered to start a career in dental nursing. A dental nurse is an assistant who works closely with a dentist, assisting in all aspects of patient care. Dental nurses have knowledge of a variety of dental procedures from general check-ups to specialist treatments. Why Become a Dental Nurse? There are a number of reasons you may wish to become a dental nurse. Some of these are explained below. If you don’t have many qualifications dental nursing provides a way to develop a solid career and a way to obtain a valuable set of skills which will likely be required for many years to come. Certain dental qualifications require no prior qualifications or knowledge opening them up as a possible career to people from a variety of different backgrounds. Compared to other caring professions dental nursing is well paid and offers plenty of opportunity for continued training and development. This is great for those looking at the long-term plan for their career and those who wish to work their way up the ladder through continued learning, experience and hard work. Most dental nurses will be able to work standard working week hours (9am-5pm) although you may be required to work evenings or weekends if the practice is open outside of these hours. Part-time work may also be available dependent on the needs of the practice, which could be attractive to those with children or those looking to get away from shift-work. How Can You Become a Qualified Dental Nurse? If you want to become a qualified dental nurse you will need to undergo the required training. The General Dental Council (often abbreviated to GDC) is the body which registers dental nurses. In order to register with the GDC you will need to obtain one of several vocational dental nurse diplomas. You can gain a qualification by starting as a trainee with a dental practice and training on the job or by taking a full-time course in dental nursing. In either scenario you must study with an approved educator and register with the General Dental Council (GDC). Many trainee dental nurses will opt to follow the first route explained above, that is to work whilst gaining a qualification. This is often a favourable method as it gives you an opportunity to still make a living whilst you are learning. By following this route, you will work towards a diploma qualification whilst working and earning from a dental practice. What Skills Do You Need to Work and Train as a Dental Nurse? If you are interested in becoming a dental nurse without prior training, you should be aware of some of the skills which a potential employer will deem to be more favourable. Primarily strong communication skills and the ability to put people at ease are vitally important as you will be coming into daily contact with patients. It is also beneficial if you are organised, with great attention to detail as you will be completing to patient notes and maintaining the running of the dental practice. What Can You Expect to Earn as a Dental Nurse? For a standard working week a trainee dental nurse salary will be around £16,000 per annum. However, many qualified dental nurses earn between £19,00 and £22,000 with team leaders and specialists able to earn up to £28,000. *These figures are a guide. Where Can You Work as a Dental Nurse? The most obvious place a dental nurse will work is in a dental practice, either private, NHS or a practice which offers both services. However dental practices aren’t your only option. Some dental nurses will find work in hospitals or community dental practices and some work in the military healthcare services. What Is a Typical Career Path for a Dental Nurse? Many dental nurses will also work as practice receptionists; however, it may be the case that you feel you may be better suited to fulltime reception work. There are specific courses available for those looking to become a dental receptionist. This training will help you understand how to deal with enquiries, train you in the correct telephone manner and how to deal with complaints. After working as a dental nurse for a number of years some people decide to become a Practice Manager as a way to progress their career using the experience they have gained whilst working in the field. There are many responsibilities involved in working as a Practice Manager and the job can be extremely demanding with a strong focus on organisation and deadlines. The Practice Manager is essentially in charge of making sure the dental practice runs smoothly for both the employees and the patients, whilst meeting important legislation requirements. What Further Training Is Available for Dental Nurses? The NEBDN Certificate in Dental Radiography is available to those who are registered and qualified Dental Nurses. The Certificate in Dental Radiography allows you to take radiographs of patients under the instruction of the Dentist. The NEBDN Certificate in Oral Health Education allows you to offer oral health advice and education to patients under the instruction of a dentist. The NEBDN Certificate in Orthodontic Nursing is available to those who regularly assist in orthodontic procedures and who are qualified and registered as a dental nurse. If you work in an orthodontic practice you will greatly benefit from this qualification. The NEBDN Certificate in Dental Sedation Nursing is available to those who assist in surgery during conscious sedation and who are qualified and registered dental nurses. In order to complete this course, you need to work in a practice which regularly completes routine sedation. This is because you are required to complete a Record of Experience and log sheets as a requirement for the examination. This course is beneficial for those who want to work in hospitals, which regularly use sedation. The NEBDN Certificate in Special Care Dental Nursing is aimed at those who regularly assist in the treatment of patients whose health or social care needs require special oral health care provision. A Certificate in dental hygiene or dental therapy can be a valuable addition to a dental nurse’s CV. Becoming a hygienist or therapist will allow you to perform hygiene treatments yourself, under the prescription of a dentist. This will make you more valuable to your practice as you can take on responsibilities of other members of your team, freeing up their time for other tasks. Why Choose Our Dental Nurse Course? By becoming a dental nurse, you will join a rewarding and continually growing profession. You will be working in a diverse environment and work as an integral part of a small team that genuinely helps people. Some dental nurse courses will require you to have prior qualifications. 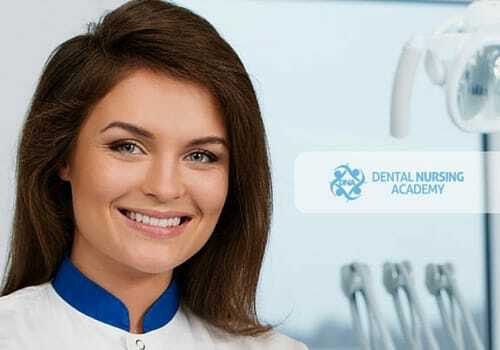 However, with The National Diploma in Dental Nursing 12-month course offered by the Dental Nursing Academy you can begin a new career without any need for prior qualifications. We teach you everything you need to know about the dental care sector, which is why we don’t believe it is necessary to have this limitation. Furthermore, our team will assist you in finding a suitable position in a dental surgery whilst you are enrolled in the programme which will allow you to receive a wage whilst gaining the professional qualification. Tel: 020 3875 0569 Mob: 07714 409 238. This course could change your life…..don’t delay sign up now.